Offering a rich digital media platform, the VIA EPIA CN Mini-ITX mainboard integrates the VIA UniChrome Pro IGP graphics processor with MPEG-2 hardware acceleration and the Chromotion CE engine to ensure smooth, crystal clear digital media streaming and playback. The platform also supports DuoView+ and has S-Video and RCA outputs to facilitate the design of dual display devices, as well as rich multi-channel audio for surround sound. Setting new standards for flexibility and feature completeness, the VIA EPIA CN Mini-ITX mainboard supports up to 1GB of 400/533MHz DDR2 memory, native SATA II 0 and 1, and 10/100 Mbps broadband Ethernet. The platform also includes a PCI port, serial, parallel and USB ports for unparalleled connectivity options. Leveraging the power efficient VIA C7 processor - based on the proven VIA Coolstream architecture and advanced 90nm process - with the energy efficient VIA CN700 digital media chipset supporting DDR2 memory, the VIA EPIA CN Mini-ITX mainboard boasts an average power consumption of just 16 watts to enable a new generation of low power consuming intelligent digital devices. 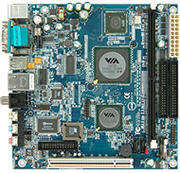 The VIA C7 processor also integrates advanced hardware security with the VIA PadLock Security Engine. Offering a comprehensive sets of security tools that includes the world's fastest AES x86 encryption engine, the VIA PadLock Security Engine enables military-grade protection of data stored and exchanged without a hit to system performance. The VIA EPIA CN Mini-ITX mainboard is compatible with Microsoft Windows 2000/XP, XPe and CE, as well as Linux, and offers developers a rich suite of security and media applications to accelerate time to market. Fully compatible with all Mini-ITX, FlexATX and MicroATX chassis and associated accessories including the new 120W DC-DC converter for VIA EPIA Mini-ITX mainboards, the VIA EPIA CN Mini-ITX gives developers and system integrators the essential tools to create innovative and flexible digital media appliances.